This Belleek spoon rest was introduced in 2015. The Belleek spoon rest features hand painted green shamrocks on the handle and measures 10 1/4" long x 3 1/4" wide. 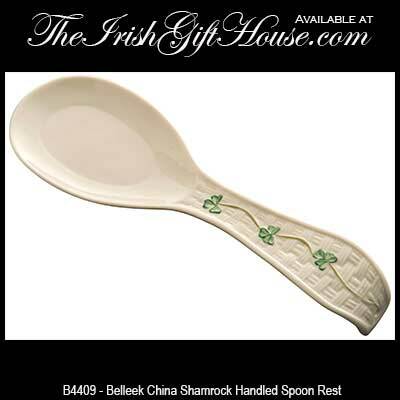 The shamrock spoon rest is dishwasher and microwave along with freezer and oven safe (to 375F) and is hand crafted in Belleek, Ireland. 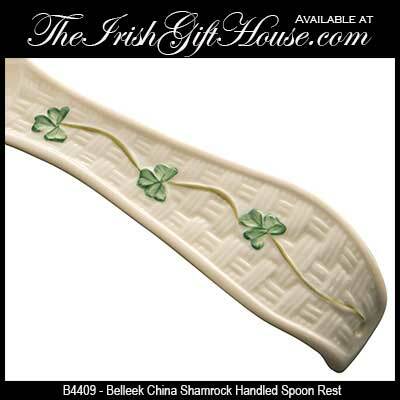 The Belleek spoon holder is gift boxed with a shamrock history card that is complements of The Irish Gift House.